Coming on the heels of the long-awaited passage of a farm bill, this year’s Congressional Tour had a more positive tone as dozens of KFB members from throughout the state mingled with the state’s delegation. With the new farm bill in place, KFB leaders now are talking about such issues as reforming farm labor programs, curbing unwarranted environmental regulations and changing various tax policies. 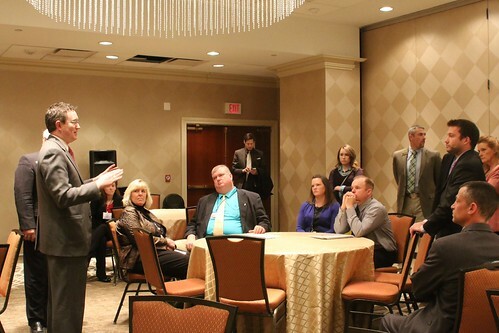 Kentucky’s eight members of Congress had plenty on their minds as they spoke to the KFB contingent -- both as a group at the traditional breakfast and in ensuing breakout meetings with constituents. Their topics included immigration reform, foreign trade, the estate tax, health care, energy policy, environmental regulations, Country-of-Origin labeling, banking, industrial hemp, the federal budget, political discourse and, of course, the farm bill. The Congressional Tour agenda also involved briefing sessions, tours to popular sites and visits to legislative offices on Capitol Hill. As is the tradition, the concluding event was a question-and-answer session with Senators Mitch McConnell and Rand Paul. 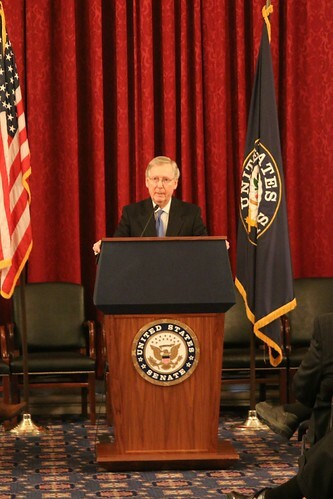 Senator McConnell addressed the group at the concluding meeting. The Senate Minority Leader explained several farm bill battles that he waged on behalf of Kentucky agriculture. The most highly-publicized was an amendment to allow for pilot projects in producing industrial hemp. This already has led to an initiative among the Kentucky Department of Agriculture and the University of Kentucky College of Agriculture, Food and Environment, McConnell explained. He then mentioned how he and other tobacco-state members defeated an effort to exclude tobacco from the farm bill, plus worked to resolve a dispute over this year’s tobacco buyout program payment, which USDA was seeking to reduce under the sequestration law applied to other programs. The senior senator expressed frustration over failure to get the Obama administration to grant Trade Promotion Authority that could lead to lead to export growth for Kentucky products. He affirmed continuing support for abolishing the estate tax. Before concluding, McConnell noted that he has served on the Agriculture Committee throughout his many years of service in the Senate. 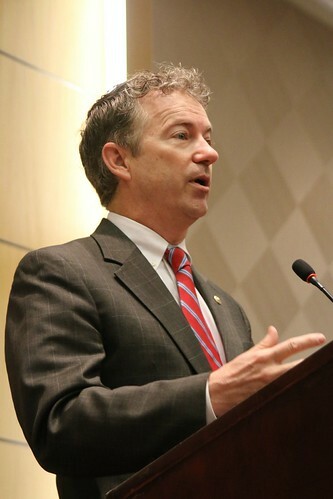 Senator Paul speaks from the Senate Russell Office Building. He had the audience’s full attention with stories of a heavy-handed government and bizarre regulatory requirements, including one report about some elderly Mississippi residents who received jail sentences for violations of a quirky environmental law. “The whole idea of our Constitution was to restrain government, not restrain you,” he said. He vowed to continue the battle against big government. 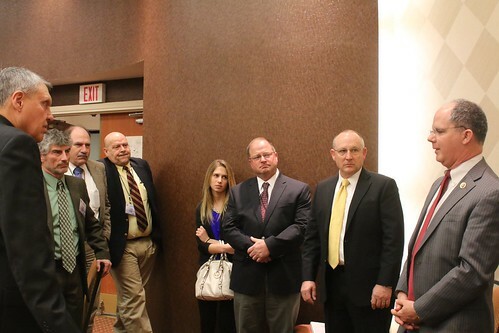 The Chairman of the House Appropriations Committee attended the event for the 34th time. He began by expressing his pride that KFB President Mark Haney also hails from Pulaski County. “He is highly respected and well liked at home,” Rogers told the group. The Somerset Republican bemoaned the impact that entitlement program spending is having on the federal deficit. “When I came here 34 years ago entitlements were only one-third of the (federal) spending. Now it’s a complete turnaround - - we only appropriate one-third of the budget and entitlements are the rest. We’ve cut $200 billion out of federal spending in the past 3 /12 years -- the biggest cuts since the Korean War - -and it’s still not enough. Congress needs to get the spine to tackle this,” he said. Rogers also blasted the EPA, calling the agency “brazen” and “out of control.” He noted that his committee had dramatically reduced the EPA’s budget in recent years. “That’s a disservice,” Whitfield said of Kerry’s remark. 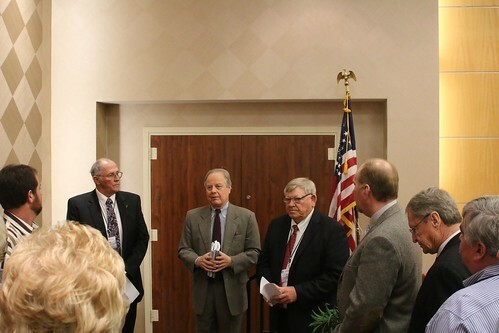 First District Congressman Ed Whitfield chats with a group that included KFB Directors Glenn Howell (left) and Russell Poore (right). He noted that a Wall Street Journal poll asking respondents to rank 15 issues in order of importance had jobs at number one and climate change at number 15. Whitfield said Kentucky’s coal industry is fading fast under the Obama administration. He stressed that the coal issue could impact all Kentuckians in the form of higher electricity costs. The effect would be most damaging to farmers and small businesses that operate on a thin margin. The Louisville Democrat said he was miffed about the “spin” war surrounding issues like the Affordable Care Act and the minimum wage. After mentioning that he is a former journalist, Yarmuth expressed his concern about the political discourse emerging from national politics. 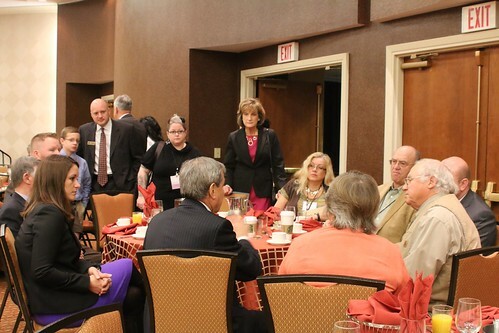 Third District Congressman John Yarmuth had breakfast with constituents. He said the Affordable Care Act has been vastly mischaracterized through a host of stories “about people disadvantaged by the ACA.” While there are indeed some negatives, a close look into most of the instances cited would reveal a more positive situation than reported, said Yarmuth. He noted that he is among a small group of House members who have continually worked on the immigration reform issue. The lack of action on the issue has been frustrating, he added. Yarmuth finished his remarks with the subject of anti-government sentiments. Second District Congressman Brett Guthrie speaks to a group that includes (at right) KFB Directors Fritz Giesecke, Scott Travis and (at left) Larry Thomas. Most people, he said, would be astounded by the widely diverse number of special interests involved in the farm bill process. With food stamping spending commanding the majority of the bill’s cost, it’s difficult to make the public understand that the farm bill is really about food security for the nation, Guthrie said. To underscore his point, Guthrie pointed to the turmoil in the Ukraine. Fourth District Congressman Thomas Massie speaks with constituents following the breakfast. Massie, who is known as a fiscal hawk, said the farm bill “was the first bill I’ve ever voted on that actually cuts spending.” He said he is part of a group advocating “the penny plan,” in which if all government programs were cut by one percent each year, there would be a balanced budget in five years. Cattle producers, he added, should be in favor because without labels lower quality beef could be mixed with higher quality in order to lower the retail cost. That would penalize quality products. Massie also alluded to the disconnection in Washington D.C.
“Part of the dysfunction in Washington D.C. is they just aren’t listening to the people in Kentucky,” he said. The Sixth District Republican began by citing statistics showing agriculture’s importance to his district. Nationally, it ranks 54th among the 435 Congressional Districts in the annual value of farm products sold, he said. Sixth District Congressman Andy Barr greets a constituent. At right is KFB Director Larry Thomas of Hardin County. He noted that he had voted in favor of three different versions of a farm bill because he understands the importance of protecting the farm economy. He said he had learned much about farm policy through an agriculture coalition he had formed to advise him. The group has had two meetings. “The best way to learn what to do about policy is to listen to the farmers of Central Kentucky,” he said. He went on to mention his involvement with resolving a dispute over crop insurance guidelines for tobacco and the tobacco buyout program payments. In the crop insurance dispute, he filed a bill in order to get USDA’s attention to change its policy, he said. Barr serves on the Financial Services Committee, where he said he has learned that the so-called Dodd-Frank law is forcing rural banks to pull back on farm loans. He called Dodd-Frank “disastrous” legislation.